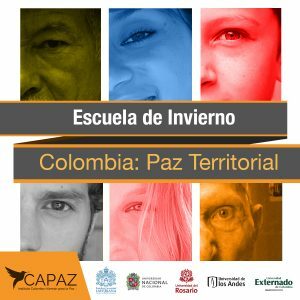 “Colombia: Paz Territorial” is the first CAPAZ Winter School taking place from November 27 to December 1, 2017 in Bogotá, Colombia. The academic program has been coordinated by the Universidad del Rosario, with the support of Universidad Nacional de Colombia, Univeridad de los Andes, Universidad Javeriana and Universidad Externado de Colombia. These universities are part of the CAPAZ consortium in Colombia. The program of the Winter School focuses on the challenges of peace building in the Colombian regions. The Winter School offers two main highlights. First, each of the five Colombian universities of the CAPAZ consortium hosts one daily academic program. The programing is the result of a logistical and collaborative effort of the universities to host speakers and participants. Second, it is the first time that the CAPAZ Institute is inviting Master and PhD students from Colombia and Germany, as well professional social leaders working as peace builders in different regions of Colombia. All of them have received a CAPAZ scholarship for their participation. 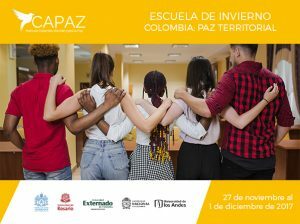 The CAPAZ Summer and Winter School offer an academic space for students, leaders and peace builders of civil society to exchange experiences and knowledge on issues related to the peace studies and the post-conflict society in Colombia. In 2017, the Justus Liebig University of Giessen hosted six Colombian students during the Summer School in Germany.